Worldwide Air Mail postage included!! 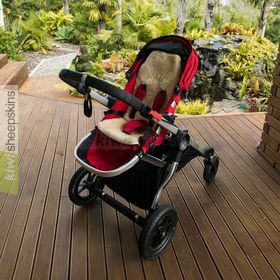 Bowron's Stroller Fleece lambskin comforter is a baby sheepskin liner for strollers/push chairs, buggies or car safety seats. Adjustable head cushion enables the Stroller Fleece to grow with baby. Like the product? Share it with friends! 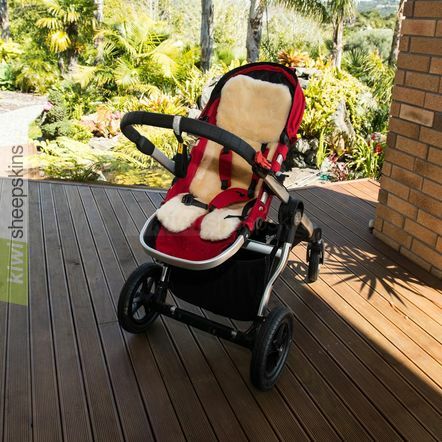 Our natural and versatile lambskin stroller fleeces offer absolute comfort for your baby or infant, and are ideal for buggies, push chairs and car seats, with an adjustable head cushion. Comments from our customers who have purchased this lambskin stroller comforter. GREAT!!! **This** is what I was remembering and they are even greater than the other ones I got 10 years ago. I love the Velcro for adjustability. FAST shipping!! It took just a week to get half way around the world. I'm very impressed. Easy ordering too. With shipping included, I paid the same stateside for a short-trim product that I was NOT at all happy with and for the same price, pretty much. Now that I know this is what I'm looking for, I will be ordering from you again and will tell everyone about you. Now... do the lambie's come in king size?! I want one for me!! I would just like to say how very impressed I am with your service. It was has been easier to order things with you on the other side of the world than it has from within the UK!! I was so impressed with the sheepskin that I've ordered one for the pram today. Thank you so very much - it has been a pleasure doing business with you. 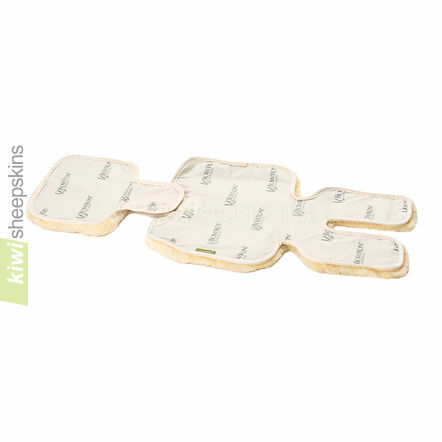 I was very pleased with the products that I received from Kiwi Sheepskins. Their prices are excellent and their free shipping offer is superb. I have ordered from this company before, would highly recommend them to friends and will continue to shop with them. You simply cannot know how pleased I am, again, with my Kiwi order -- which arrived today, in only 4 days! My young friends with the new Thanksgiving baby and the strapping 3-1/2 year old are wonderfully happy to have the stroller fleeces -- perfect holiday presents. I am lucky to have found Kiwi Sheepskins! See more testimonials for our Baby Products range. 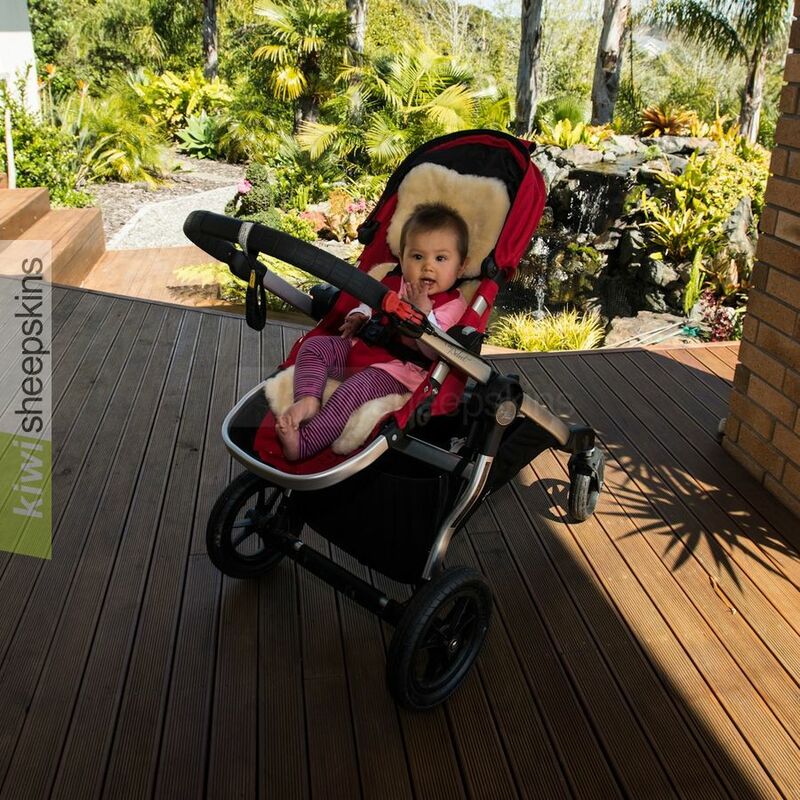 Whether you're looking for sheepskin footwear for the family, lambskin rugs for the home, sheepskin car seat covers, the ideal gift for the new baby or medical & wheelchair accessories to bring relief from discomfort, you'll find it all here and more! 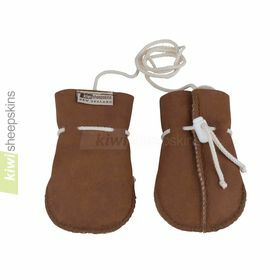 We hold huge stocks of premium New Zealand made sheepskin products all of which come with a 12 month warranty. Enjoy browsing our newly updated website. 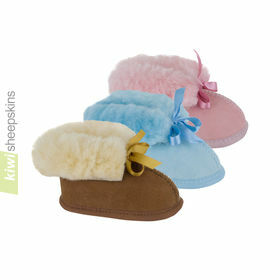 Keep your feet comfy and warm with our sheepskin slipper range made in New Zealand to our exacting standards. Unlike inferior imitations our slippers are only made from real sheepskins with the wool pile still attached to the fleece's leather for best comfort and durability. 12 month warranty on all our sheepskin products. Genuine sheepskin boots for all the family - from cute little baby boots to our wide range of adult's tall boots. All made in Canterbury, New Zealand using premium grade twinface sheepskins tanned specifically for sheep skin footwear use. As with all our sheepskin products they come with a 12 month warranty. New Zealand sheep skin rugs, natural pelt shaped - from Spring Lamb singles to huge 12-pelt floor rugs. Excellent range - long wool sheepskins, shorn lambskins and curly wool shearling plus many size and color options. Premium grade pelts all sourced and tanned in New Zealand by long established tanners. New Zealand made designer sheepskin rugs including round, rectangle and border styles up to massive 16-pelt sizes. Beautiful masterpieces created using mixed wool types including natural black, curly wool shearling, shorn lambskins and regular long wool. Large custom styles and sizes also available. Bowron and Auskin baby care rugs provide a natural, warm and safe environment for babies. They're a great gift for use both at home and as a versatile travel companion. The natural insulation of lamb's wool helps baby stay warm in winter and cool in summer, and the wool absorbs moisture to help keep baby dry. Sheepskin gloves and mittens made from young lambskins for supreme softness. Our gloves are excellent for driving and the mittens ideal for snowy winters or just for walking to work in the cold. Keep your head and ears warm with our winter sheepskin hats for both men and women. Made from a variety of lambskin and sheep skin types for softness, comfort and coziness. 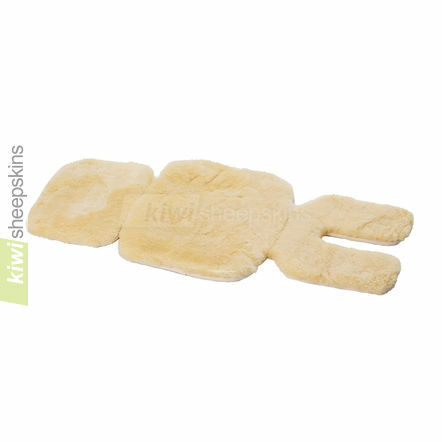 For durability our New Zealand made car seat covers are made from whole sheepskin pelts, not scrap pieces. The universal fit design fits over the headrest and lays loosely over the seat to accommodate most seat shapes. Excellent all year due to properties of sheepskin that keep you warm in winter and cool in summer. To match our huge range of sheepskin floor rugs we offer sheepskin pillows/cushions in the same range of long wool colors. Other miscellaneous products include sheepskin pet rugs so your best friend doesn't miss out on the luxury of genuine sheep skin! You'll also find our sheepskin care products here - brush, shampoo and water repellent. Genuine medical sheepskin products from New Zealand can improve the quality of life to those confined to a bed, wheelchair or seat for prolonged periods. In addition for use on wheelchairs and beds, our medical sheepskin seat pads offer great comfort to anyone on their office chair, car seat or even favorite armchair! For 17 years Nature's Beauty have been producing natural skin care products combining wholesome and nourishing elements from our beautiful, clean and natural New Zealand. Nature's Beauty natural skin care products bring the essence of New Zealand to you... Beauty as nature intended. What is a Medical Sheepskin? US DOLLAR PRICES INCLUDE INTERNATIONAL AIR MAIL DELIVERY!! fast dispatch, in stock items dispatched within one working day! Cookies are currently disabled in your browser. 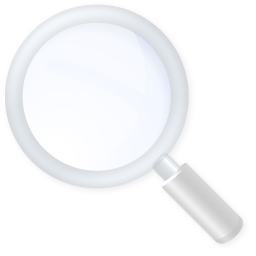 Several features of this site will not function whilst cookies are disabled.